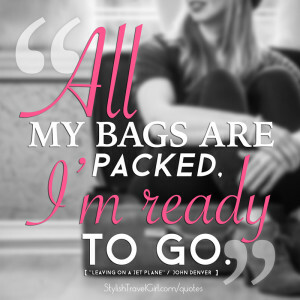 Packing cubes and garment folders are the best way to keep your clothing organized in your carry-on. Whether you choose to organize your clothes day-by-day, by clothing type, or all in one container, there’s a shape and size for you. 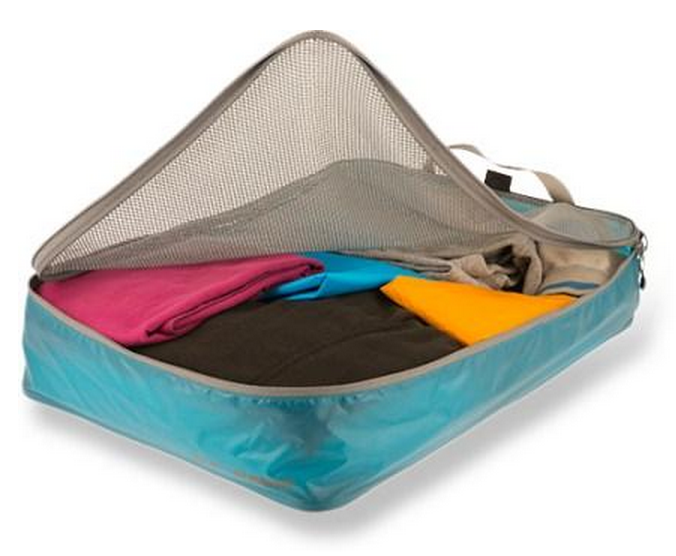 Packing cubes, compression cubes, and garment folders are your options for keeping your clothing in order while you’re out exploring the world. A good, standard packing cube is made of lightweight, high quality materials, and it’ll fit a decent stack of clothes. 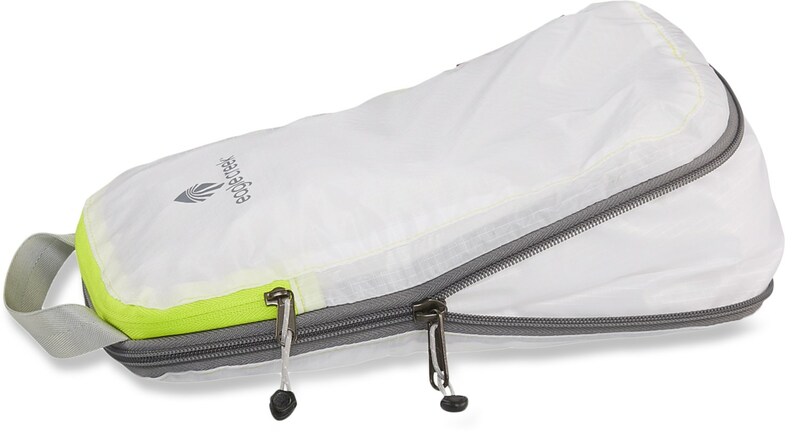 Nearly all have a full 3-side zipper, handle, and mesh that allows you to see inside. The cubes listed here have the highest reviews on the web — we’re talkin’ 4.5 stars and up. Use large cubes for large clothing articles like pants, sweaters, long-sleeved shirts, and even jackets. Use medium cubes for tees, short sleeve blouses, shorts and leggings. Save your undies and socks for the small cube. Tip: Play around with rolling clothing that isn’t prone to wrinkling. You may fit a lot more inside! Note: Zipper does NOT wrap around 3 full sides on this design. These cubes have a wrap-around compression zipper, allowing you to expand the cube for packing and compress it for space-saving. But beware! These containers are prone to wrinkling their contents, and your stuff will be less accessible if you choose this style over the standard design. Here’s your best bet for keeping your clothes wrinkle-free (aside from transporting them on a hanger, of course). A garment folder comes with a folding board to aid you in squeezing 8-12 articles of clothing neatly inside a medium-sized folder. Watch a brief video overview of the Eagle Creek model on Zappos.com. There’s oodles of options when it comes to packing cube sets. The selection varies by brand, but most offer same-size and multi-size sets. Below are some of our favorite pre-made combinations for organizing clothing. 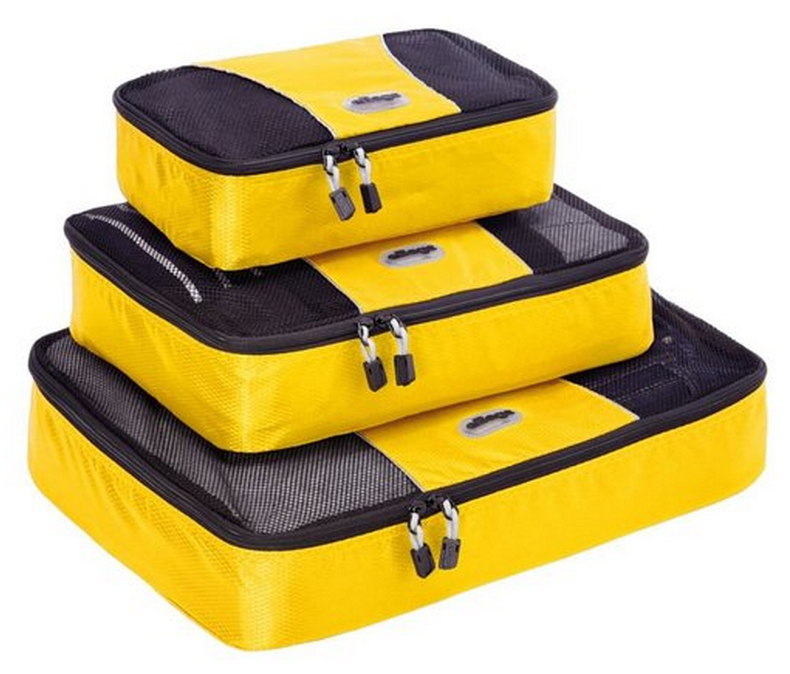 With the most consistently high customer ratings and up to 13 variations in color and pattern to choose from, the eBag Packing Cubes are our favorite in the standard cube design. Plus, the price of their large cube beats Eagle Creek and Sea to Summit (other well-reviewed brands), at $29.99 for a set of 3. The ultralight material won us over on this one. 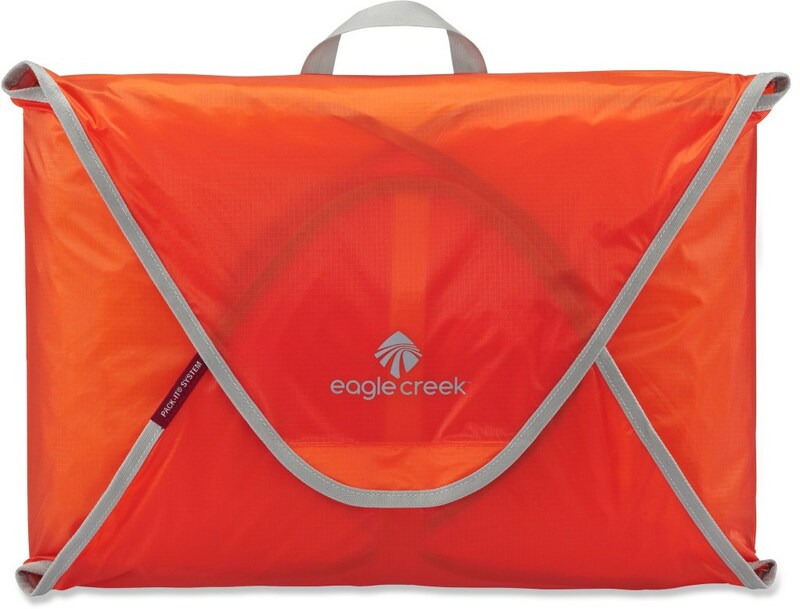 Vibrant color options also make the Eagle Creek stand out from the competition. Our one complaint is the zipper; we wish it wrapped around further to allow for easier access to the packed contents. The REI model doesn’t have this problem. The EC garment folder is our definite fave. Again, the vibrant colors and lightweight material are big plusses. Finally, the visual folding instructions printed on the back are a very helpful reminder of how to use this thing! Eagle Creek’s starter set has the most variety while being touted as a high quality product by its reviewers. A garment folder is included, and you’ll save a few bucks purchasing the set rather than the individual pieces. We like their Specter Starter Set, too, which you’ll prefer if you like compression over standard cubes. And we have to mention the EC Completely Organized Pack-It Set. For $50, you get five pieces! 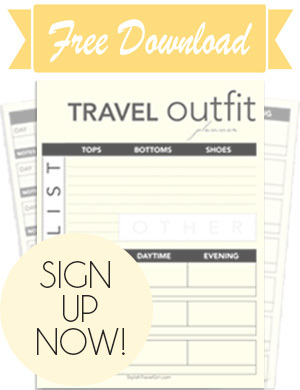 What’s The Next Step in Organizing Your Carry-On? 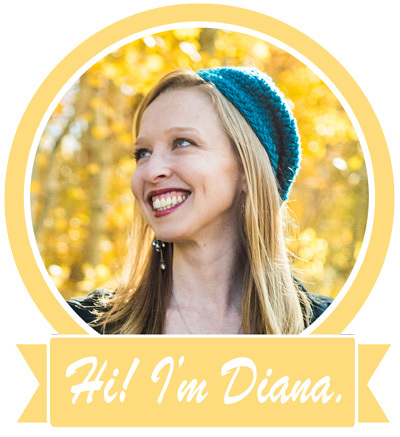 Don’t miss the next steps, plus next week’s article: FINDING THE RIGHT PACKING CONTAINER COMBO FOR YOU! 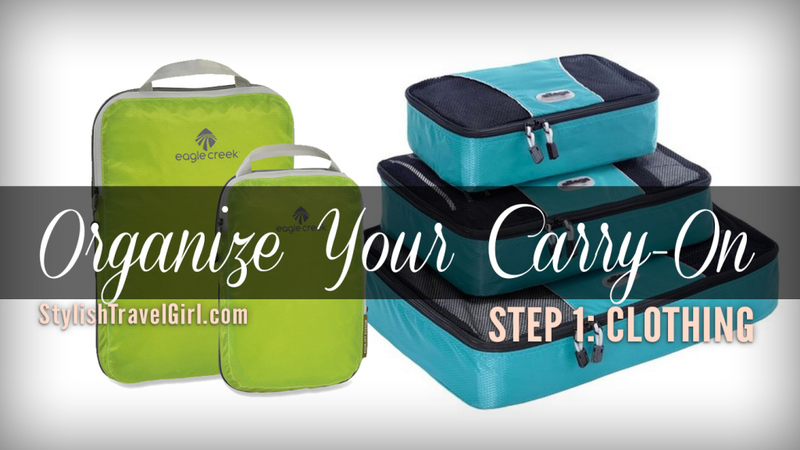 ← Intro to Packing Containers: Organize Your Carry-On in 4 Steps!